Jack and Rachel O’Shea and their children are ordinary people living ordinary lives – or so it would seem. But everything changes when Jack turns up at Rachel and the kids’ home with a mysterious jewel. One of the kids accidentally creates a portal to another world, Spassenia, while messing around with the jewel, and Jack and Rachel are thrown back into a world they thought they’d never see again. While the children struggle to comprehend their newfound status as royals, their parents must battle to regain the throne of Gammalion. 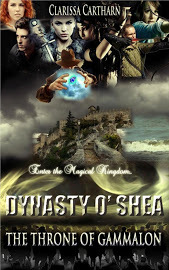 Through many incredible adventures through magical kingdoms complete with their own legends, peoples and fascinating creatures, the O’Shea family learn some vital lessons about themselves and become closer than ever before. This is a promising debut novel. It includes everything you might expect from an epic fantasy – mythical creatures, incredible landscapes, bloodsoaked battles, heroic characters and even some romance. The various realms of Spassenia are richly populated with diverse and fantastical tribes and animals. Each member of the family is uniquely characterized and learns much about themselves and their family. From the epilogue of the book, I gather we can probably look forward to a sequel, so those readers who have fallen in love with the world of Spassenia will surely be delighted to have another chance to explore that world with their favourite characters.